This product has been updated. The TGA is a turnkey trace gas analyzer with all the software and hardware required for the automated analysis of low ppb impurities in a variety of gases. Each system is built to customer specifications from standard VICI parts, with all methods, operations, and procedures documented in a custom validation packet. Every VICI TGA performs detection of impurities in He as a basic application, but analyzers can be configured for other single or multiple gas matrices. 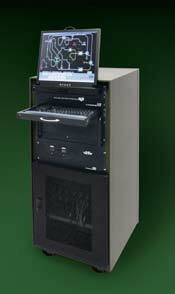 The sampling system and industrial grade CPU can be rack-mounted, comprising a totally integrated unit. Standard features also include configurable data sharing through the included OPC server and automated routine maintenance processes. Please call us at 800 367-8424 for more details, or email the VICI TGA department directly. Tech support for the life of the instrument is included in the purchase price, beginning with thorough application validation and documentation and on-site installation and training. Once the instrument is installed, support is available via phone or remote access.